The completion of the Withdrawal Agreement between UK and EU negotiators was meant to signal the end of months of uncertainty, quell fears of a no-deal Brexit, and set the groundwork for talks on future relations. However, Prime Minister Theresa May’s hard-fought deal has come under heavy attack from all sides of the political spectrum in the UK, with Westminster descending into chaos amid a fractious parliament. The endless Brexit headlines have generated a lot of choppy trading for the pound. But the British currency appears to have, for the moment at least, found a floor around $1.2650, as a range of scenarios, including a reversal of Brexit, are still in play. British MPs began five days of debate on the Brexit deal on Tuesday but the first day proved disastrous for the prime minister. Lawmakers forced the government to publish the full legal advice on the Withdrawal Agreement after resisting demands to do so. In a major humiliation for May, the government was found to be in contempt of Parliament for the first time in decades for refusing to publish the full legal advice. In a further setback, MPs voted in favour of giving Parliament a say on what happens next should May’s deal get rejected. The latter has significantly reduced the odds of Britain crashing out of the European Union without a deal as Parliament is unlikely to allow the government to go ahead with its threat of a no-deal Brexit if MPs don’t back May’s plan. That prospect is possibly why the pound didn’t tumble much more sharply after the government’s defeats and found support just above the $1.2650 level, not too far from the August trough. The recent lows, while some distance below the 2018 high of $1.4376, are still significantly above the levels burrowed in 2016 and early 2017 when sterling dipped below $1.20 a couple of times as uncertainty about Brexit hit a peak. This suggests the markets see a reduced chance of a ‘hard’ Brexit even if the deal is voted down by the House of Commons. One of the alternative options being talked about for a plan B is membership of the European Free Trade Association (EFTA), which would keep the UK inside the single market, hence, avoiding the need altogether for a backstop for the Northern Irish border issue. The backstop problem is being cited as the main reason why MPs are so opposed to May’s deal as it could keep the UK trapped inside the EU’s customs union for years after Brexit, if not indefinitely, if the British government cannot come up with a viable solution of maintaining no hard border that satisfies the EU’s concerns. However, one potential flaw of joining EFTA is that the UK would be unable to end free movement of people, and therefore could struggle to win support from Brexiteers. A bigger threat though for Brexiteers from Parliament being able to instruct the government what to do in the event the deal doesn’t get passed is the possibility that MPs could force through a second referendum on EU membership. Remainers have long argued that the British public should get to decide on any final Brexit deal and be able to opt to stay in the EU if they don’t like what’s being put on the table. Adding to the growing speculation that Brexit may not even happen is the expected ruling of the European Court of Justice (ECJ) that the United Kingdom can unilaterally revoke Article 50. On Tuesday, the advocate general of the ECJ issued an opinion on the case brought by Scottish lawmakers, saying that the UK does not need the permission of other EU member states to cancel Article 50, which triggers the withdrawal process. Although the opinion is non-binding, the ECJ judges usually follow the advocate general’s advice and the final ruling should come within days. While the chances of May’s government revoking Article 50 are extremely low, the odds that there could be a new government in place (either from a leadership challenge or snap elections being called) should the Brexit deal get voted down are somewhat greater. 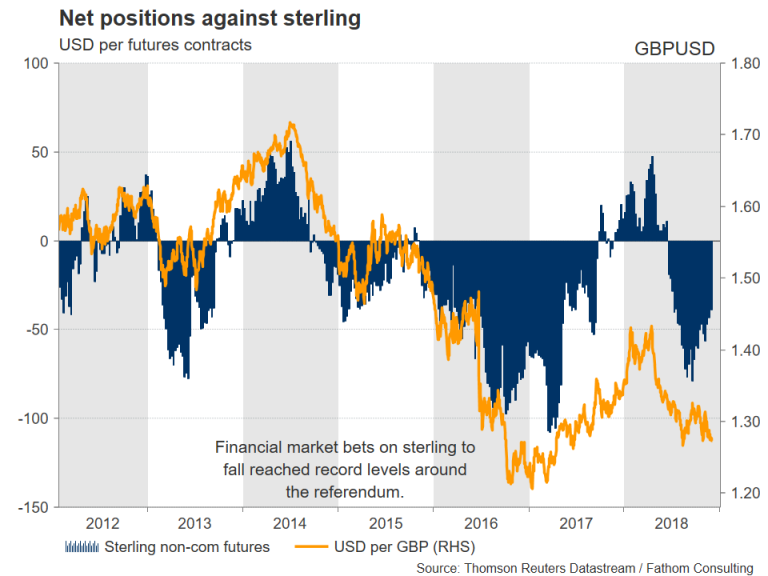 The distinct possibility that Brexit can be reversed is likely to keep the pound bears at bay until at least the final vote due on December 11 (barring any last-minute delays to the vote). Still, the expected knee-jerk reaction to the Brexit deal failing to pass through Parliament is sharp sell-off. Sterling could initially seek support at $1.2590 – an important resistance and support area during 2017. A breach below this mark could see the declines accelerate towards the $1.24 handle, near the 161.8% Fibonacci extension of the upleg from $1.2694 to $1.3174. Further down, the $1.21 level would come into focus should market panic ensue. In the highly unlikely scenario, though, that May manages to get her deal through the Commons, the pound could be set for a major upward correction. Investors shouldn’t discount the possibility of May offering late concessions to her Conservative MPs. The prime minister is reportedly considering giving MPs a vote on whether to initiate the backstop, meaning Parliament would be able to block the UK from entering the backstop arrangement. It’s also possible, though remote, the EU could be willing to make some further compromises to May to help her sell her deal so as to avert a ‘hard’ Brexit. Any improved offer on the backstop problem could be enough to persuade Conservative rebels to support the deal out of fear that voting against it could lead to a second referendum or fresh elections. The pound could enjoy a substantial rally should the deal get voted through, with a move towards the 50-day moving average and the 50% Fibonacci at 1.2934 being an easy run. A break above this level could send the British currency as high as the $1.33 level, which is close to September’s peak. Higher up though, the pound could find it more difficult to get past the next major hurdle around $1.35, which represents the 50% retracement of the April-December downtrend.